My Facebook account has evolved over time. I originally created a Facebook account to share photos with my family, since that was all the younger generations used. It soon turned into a friend’s page and yes, you guessed it, now it is a place where I meet up with bloggers and cyber friends. The day I learned about the FaceBook Fan Page I wished that I could have my blog posts imported automatically in addition to Networked Blog. And finally, after much digging and frustration, I found it. I am very excited to share the feature of importing your blog posts to your Facebook Fan page. Follow these simple steps and you will be importing your blog posts (using the RSS feed) into a Facebook Page yourself. 1. Go to your Facebook Fan page. 2. Click on the Notes tab in the navigation area, which is the left side of your Fan Page, you should see the Notes icon. If you don’t see it, you may have to click on the plus sign to display it. 5. Click on it and choose to import a blog. 6. If you can’t find the icon on your Facebook Fan page, you will need to do what I did by searching for it. On the Search window type Notes and click search. The Notes Apps should pop up, click on it and you will see your Notes. Click on the Edit Import Settings. 7. Once you are in the Edit Import Settings. You should see a window to enter your Feed's URL. 9. Click on the agreement term. 10. 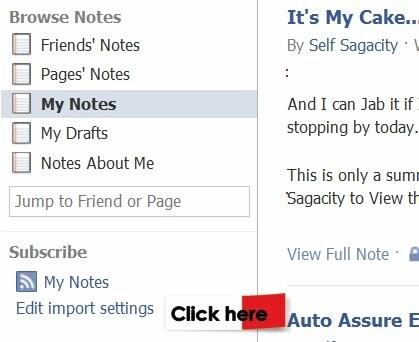 The page will import your blog posts if you already have blog posts. Isn't it great? You don't have to worry about having a plain boring no post page anymore. The more your fans click the more they will find out how terrific your blog is! Great post! Just getting my FB Fan Page up and running! Today I'm hosting my very FIRST blog hop and would love if you could come support me! Now following you and will be sure to check out your FB page! I'm stumped! Where is 'edit import settings'? I post the ones that I want to post...but don't want to post all of them to facebook. But thanks for the instructions. I am sure people will be thankful to learn how. Thank you so much, this was a great tutorial!! Hello, I'm here from the Weekend blog hop and your newest follower. I'm so glad I found your blog. I hope you'll come visit and follow my blog too, so we can be official friends. Thanks and have a great weekend! I'm participating in the “Week-End Blog Hop” and I’m now the newest GFC follower of your great site. Hope you have a chance to check out my blog, have a look around and maybe follow me back!! I tried something like this but I was disappointed because it didn't post the pictures. Does this one post a picture that goes along with the post? You have lots of great information. I can't wait to read more and go through some of your older posts. Very nice! Thanks for the research and the information. I will check this out as soon as I finish posting comments. Thank you!!!! I'm going to do it right away! I appreciate the info! New follower from Weekend hop...hagw! I don't use Facebook that often, but will look into it..
Good information. I'll have to see if I ever opened a Feedburner account. Great info. Though I've now started posting my blog posts by hand, because of the way Networked Blogs clumps posts. You end up showing up in someone's feed as "18 new posts from Networked Blogs" and this often get overlooked. wow, thank you so much, I just learned something great here...I am going to my facebook fan page now to do just that!